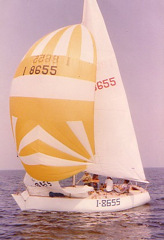 and built in 1978 so she started off to suit the IOR 18' rule but had to be changed during the build to 18.5'. She was a short hull (7.2) and heavy (1650kg) with a centreboard. However during construction he abandoned the centreboard and fixed a fin keel and made her lighter.